As the sponsor of Sneak Peak Friday at the 2018 USA Science & Engineering Festival (USASEF), Chevron joins companies and government organizations from across the country to promote STEM education through interactive learning. In their Chevron Tech Zone, students can engage in hands-on activities that will allow them to experience everything STEM in an accessible and, most importantly, enjoyable way. The Tech Zone partners with Project Lead the Way, The Fab Foundation, and Tech Bridge, as well as volunteers from Howard University. At the head of the event is Blair Blackwell, manager of education and corporate programs at Chevron. She is responsible for Chevron’s education-focused initiatives across the U.S. 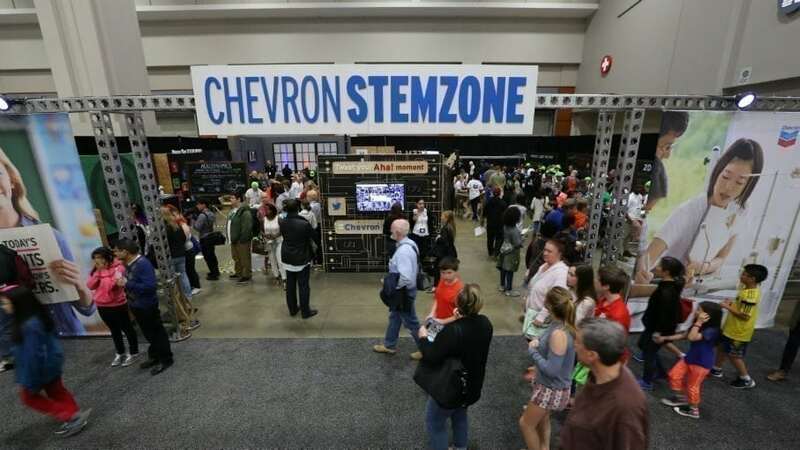 In this interview, we talk with Blackwell about the importance of STEM education and how Chevron fits into the overall picture of the USASEF. Innovation and Tech Today: Could you describe your relationship with the USA Science & Engineering Festival? Blair Blackwell: Chevron’s been a supporter of the USA Science & Engineering Festival for several years, and we are excited to once again bring our Chevron STEM Zone and some of our partners to the convention center, because it is really one of the biggest celebrations of STEM in the country and helps provide so many students with opportunities to get excited about science and engineering. And so we think it is a great event, and a great celebration to support. I&T Today: Why Chevron and why STEM? BB: Chevron has been supporting STEM in communities where we operate for decades. We recognize the importance of science and engineering in our communities, as well as for our company. We, obviously, are a company of engineers, and so we see the students of today as those engineers and entrepreneurs and innovators of the future. We want to help support their learning and their ultimate success, whether they go on to become a part of the Chevron workforce or whether they are just helping to solve some of our country’s greatest challenges. I&T Today: Speaking of that, is the skills gap something that has affected Chevron in particular? BB: So, Chevron certainly sees the skills gap as something that is incredibly important for us all to pay attention to. We’ve seen it in certain areas of our operations, but also, just even beyond the skills gap, Chevron sees the importance of supporting education, and STEM education as something that’s absolutely vital for all students… As we look towards tomorrow, we’re not going to be able to get by without a STEM literate citizenry. So, we believe strongly that STEM skills are absolutely vital for all student success. I&T Today: Chevron seems really focused on getting young girls into STEM education. This is something that you’re particularly passionate about. Could you explain why that is? BB: Absolutely. I think diversity and inclusion is something that’s incredibly important to our company, and we recognize that right now, our (and by “our,” I mean the country’s) STEM workforce and STEM pipeline does not look as diverse as the general workforce numbers. And so, by getting more women, as well as more underrepresented minorities into STEM, I think that’s ultimately going to serve all of us well in terms of the types of innovations, and the types of success that we’ll see for both companies and communities. I&T Today: You had a personal interest in pursuing a scientific field at a young age. Do you remember having any experience with those obstacles? BB: Yeah, absolutely. So I grew up wanting to be a shark biologist. But then, when I was making the transition between high school and college, I didn’t really have any role models that I could look to or speak to about what a career in science and engineering really looks like. And so, I went more into a policy field, which makes me incredibly passionate now about the work that I do to try and reach out to young girls and others who might not necessarily consider the tremendous kind of social impact that they can have through a career in science and engineering. I&T Today: Where did the initiative first start? Was it something that you helped to foster, or was this something that Chevron was already doing? BB: Actually, we can go back about 100 years. So, back in the ’20s even, Chevron was supporting kids in California, learning more about the technologies of the day, which at that time, meant supporting students learning more about aviation. So Chevron’s STEM support of recent years really builds on decades of supporting education in our communities and recognizing the importance of science and engineering. Education is at the heart of building a strong community. Strong communities are better places to do business. We’ve been able, as a company, to build upon that in recent years with our continued and increased support STEM education at a national level. And that’s our involvement with the USA Science and Engineering Festival. I&T Today: What are some figures that show what Chevron has done in recent years to help support and fund education initiatives? BB: Since 2013, Chevron has provided over $340 million of support to education, globally. In the United States, we’ve supported organizations like Project Lead the Way, which is an engineering program of study. We’ve supported the Fab Foundation and really encouraged the Maker Movement. And then, [we] have supported opportunities like the USA Science and Engineering Festival here in our home state, and where our headquarters are in the Bay Area, we support the Bay Area Science Festival. What our support aims to do is, one, through events like the USA Science and Engineering Festival, to create that spark, and that opportunity for a spark, when a student can come in, get hands-on with science and engineering, and see how this related to their everyday life today, as well as to their future. And then, to follow that up with our other partnerships, in ensuring that when those students go back to their communities — whether it’s their schools, or many of their after school programs — that they have deep opportunities to actually engage and learn those skills in science and engineering that are going to make them successful. I&T Today: What has the response been like, and what have you noticed personally? BB: I think the response of everyone who has the opportunity to see students’ eyes light up and engage, whether that’s as they’re coming through all of the exhibits at the festival, or whether that’s back in their schools or walking into a Fab Lab. To see students engaged and excited about learning really just helps us to continue this commitment. It’s not only incredibly exciting, but it’s really important as we look at our kids’ future, to ensure that they get the skills they need to be able to succeed. And I would note, as well, when we talk about STEM skills, it’s not just the technical skills and understanding that goes into creating a computer programming, or building a bridge…But it’s also where students have the opportunity to think creatively, work with a number of their peers, having to collaborate, having to test something out and maybe have it not work the first time, but to go back and then figure out how they need to fix something. Those are the kinds of skills that are going to be, in combination with the technical skills, so important for kids to actually succeed. Particularly as we look at jobs of the future, where we don’t even know what some of those jobs exactly are going to be. Because innovation and technology is moving so fast. I&T Today: What do you say to people who resist the idea of a private company like Chevron having a hand in the education world? BB: I think supporting our students and supporting education across the country is so important, and such a big task, that we all have to work in partnership in order to succeed in that challenge. So it’s going to take companies thoughtfully engaging with teachers, and educators, and local school districts. It’s only through partnership that we’re going to be able to address the needs of our students and to provide them the opportunities that they deserve. I&T Today: What do you see on the horizon in this regard? In terms of Chevron’s overall STEM initiative. What’s forthcoming? BB: So, over the last several years, Chevron has been able to build up some really exciting partnerships that I’ve mentioned, with the festival, with the Fab Foundation, the Maker Movement. And, we’re going to continue to build upon those investments. So many of the projects that we see in our business, they’re long-term. They require sustained investments, and education is the same way. So, continued support of those partnerships, as well as deepening and building upon those partnerships, building upon what we’re learning works … And then just like we’re asking students to do as part of the engineering design process, tweaking and integrating on those areas where maybe we’ve had some success but not quite as much as we would like, continuing to build upon those. Think that’s where, as we look out into the future, we are going to continue to invest in partnerships for the long-term.